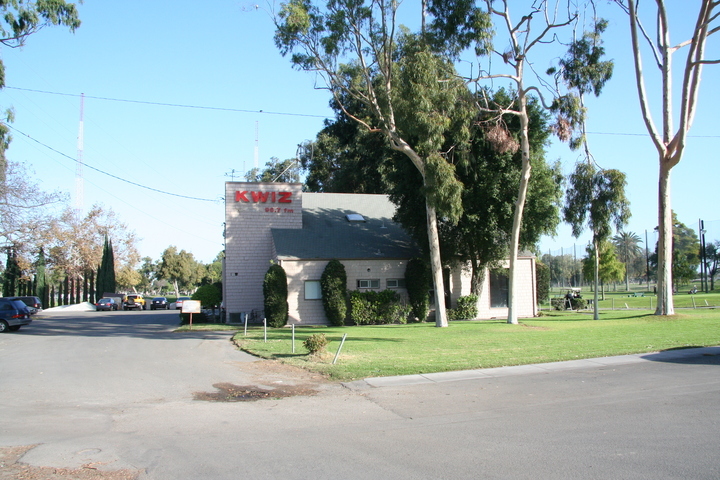 Our first stop of Monday morning, about half a mile east of Harbor Boulevard at 3101 W. Fifth Street in Santa Ana, are the studios of KWIZ (96.7A Santa Ana), on the grounds of Willowick Golf Course. The two washed-out towers seen in the background at left are part of KVNR (1480 Santa Ana) array; when KWIZ moved its studios here in the mid-1960s, the stations were KWIZ and KWIZ-FM. The FM has called this building home ever since, but in recent years the AM has been leased by Little Saigon Radio, which has its own studios in Westminster. (Prior to moving here, both stations were in downtown Santa Ana.) KWIZ is now owned by Liberman Broadcasting, and has a Spanish-language format under the name “La Rockola”. KWIZ, for what it's worth, began life as KVOE, the “Voice of the Orange Empire”, which was also the name of the licensee. It had been a class-IV station, ending up on 1490 post-NARBA; in the 1940s it became a class-III on 1480, which is when this transmitter facility was built. KVOE-FM (96.7) débuted in 1948, and the stations later became KWIZ and KWIZ-FM, and more recently KVNR and KWIZ.